This course is for the expert user who has good experience with Microsoft Excel or has completed the five courses in our Beginner Series plus Expert Level 1. This course will teach you how to work with dates and times in Excel. We will begin by learning the different valid date/time formats. You will learn how Excel stores and handles dates internally (behind the scenes), and you will learn how to perform date/time arithmetic: adding two dates, calculating the difference in days between two dates, and so on. Next, you will learn about all of the different custom date/time codes. You will be able to construct your own personalized date/time formats so that you can display values exactly as you want. For example, you could create a custom date/time that reads "Jan 01, 2011 at 6 PM." Next we'll begin looking at the wide array of date/time functions, including Now, Today, Year, Month, Day, Hour, Minute, Second, Weekday, Date, and Time. You will learn how to determine the current system date/time. 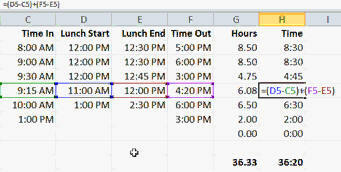 You will learn how to deconstruct a date/time value (what is the month component in 3/1/2011). You will learn how to build a date/time value from it's various parts. You will learn more about adding dates and times together (add 3 months to 4/5/2011). You will learn how to calculate the difference between two dates (in years, months, days, etc.). We will cover the YearFrac and DateDif functions. You will see how to calculate someone's current age given their date of birth. You will learn how to calculate an anniversary date. Often times you're given spreadsheets or date from someone else who doesn't necessary know how to properly input data. Next we'll learn how to fix bad date values given to you by someone else. For example, perhaps they typed all their dates in as "19990301". We'll see how to fix that. We will cover more popular date/time functions including DateValue, TimeValue, EDate, EOMonth. You'll learn how to figure out the last day of any given month, and by extension, how many days a particular month has (handy for accounting). You learn the NetWorkDays, NetWorkDays.INTL, WorkDay, WorkDay.INTL, and WeekNum functions. You'll see how to calculate the number of work days (Mon to Fri) between two dates. Then you'll see how to add your own custom list of excluded work days (such as holidays). You'll also see how to specify your own work week (perhaps you work Mon to Sat). You will learn how to accurately calculate the difference between two times. This is essential for creating an employee time sheet, which we'll do in class. You'll see how to calculate the total hours worked (including a lunch break). You'll learn how to display the total time in either hours and fractions of hours (such as 40.5) or hours and minutes (such as 40:30). Finally, we'll go over a ton of date and time tricks. You'll learn more about AutoFill and how it handles dates/times. You'll learn how to calculate specific date/time values, such as the first and last days of a month, the total number of days in any month, what quarter a month falls in, the first and last days of a year, what day number (in the year) is it, how many days are left in this year, and lots more. You'll also learn how to add up hours, minutes, and seconds (and display them however you want) plus how to work with fractions of a second. Again, this is the perfect class for anyone who wants to learn how to work effectively with dates and times in Microsoft Excel 2010. Of course, if you have any questions about whether or not this class is for you, please contact me. When you are talking about setting up "custom format". you say four year format but type only three Y's. A minor comment. 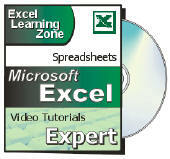 I am very much impressed by the entire Excel 2010 expert level 2. If you get some time, i request that you demonstrate to us in a video seminar the equivalent date functions in Access. Or alternatively, which of the date funtions in this Expert Level 2 do (not) work in Access? Video 6 at 2:50 minutes. You are typing in "time in" amounts using 8am and when you move to the next cell it changes to (8:00 AM). Was wondering which cell formatting you are using that gives you that. I'm making a mistake here with my formatting and can't get the "total hours". I keep geting #VALUE!,no matter which time format I use. Just use the TIME format from the quick select menu or pretty much ANY time format from the Format Cells menu. Also make sure you type in a SPACE between "8" and "am" as you type it, otherwise Excel will treat it as text (dumb, I know). It's one of the things I find extremely annoying about Excel. If Excel sees "8am" it should treat it as a time. Thanks for sharing a great tool to calculate the quarter (5:30), but what if a accounting year begins 1 Oct. Is there anyway to "trick" Windows to show 1 Oct as the first quarter and July - Sept as the 4th quarter? What values do you have in D2 and C2? I don't know. It's a straight-forward subtraction problem. It would have to depend on what values are in your other fields. Without seeing the sheet, I can't tell you. Laurie Jones on 4/13/2013: Richard, you are by far the best teacher I have ever had in computer classes. Can you tell me when will you have the Excel Advanced courses available in the Theater? Thanks so much. EXCEL ADVANCED has surprisingly few people signed up for it on the Waiting List. As of right now we only have about 40 people signed up, whereas Visual Basic has twice that, and Access has over 400 people waiting for the next lessons. So you see where my priority has to be right now. YES, I'm definitely going to throw a bunch of advanced Excel lessons in there, but I probably won't get to them until this summer... unless people VOTE FOR EXCEL on the Waiting List. Joe Beniacar on 4/18/2014: Hi Richard, thanks a lot for your very helpful videos! Just a quick question: when would it be faster to use DATEVALUE and TIMEVALUE with Format Cells, rather than simply typing in the actual Date to a cell to begin with? Thanks! I get a 'Value' Error with the above; G93 and AC2 are Dates...Anybody? Are you wanting to return an array of values if it matches? heri on 6/30/2015: i want to calculate difference between two date n time for example:- cell1 30/06/15 cell2 09:50:00 am cell 3 01/07/15 cell4 02:50:00 am. Plz tell me if you can do it. Rajiv Dass on 11/21/2015: Excel 2010, Expert 2, lesson 3 (00:56), you have input lower case "am/pm" but the output was upper case "AM"? Rajiv Dass on 11/22/2015: Excel 2010 Expert 2 (3:19), you inputted three "yyy" to get a four digit year for Custom and toward the end (05:24), Custom Date Codes only two options "yy" & "YYYY"?